Rev. 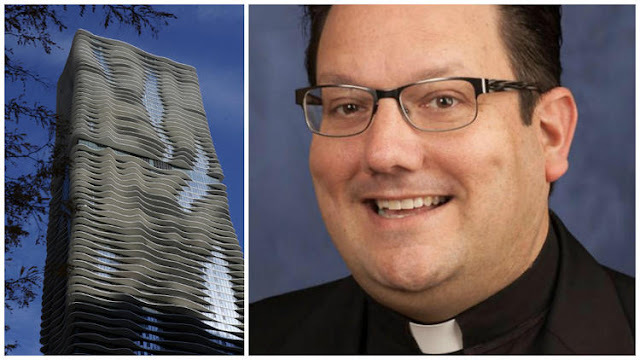 James Csaszar, pastor of Church of the Resurrection of Columbus, New Albany, Ohio, died after throwing himself off the Aqua tower. He committed suicide on Dec. 20, 2017. The building was the Radisson Blu Aqua Hotel, with 82-stories. Until November, Csaszar had worked as a Catholic priest at the Church of the Resurrection in New Albany, Ohio. After misconduct allegations were revealed about the priest, the 44-year-old he was placed on administrative leave. It is with deep shock and sadness that we have learned of the death of Father James Csaszar, pastor of the Church of the Resurrection in New Albany, who took his own life yesterday in Chicago.On November 7, Father Csaszar was placed on an administrative leave by the Diocese of Columbus after diocesan officials were made aware of excessive and questionable text and telephone communications with a minor and potential misuse of church funds while serving as pastor of St. Rose Parish, New Lexington. Following a diocesan review of the matter, the New Lexington Police were contacted and all information was turned over to them and the Ohio Bureau of Criminal Investigation for their review; an investigation was being conducted at the time of Father Csaszar's death. We are reminded throughout sacred scripture that God our Father is loving, merciful, compassionate and forgiving. We also know that in his years of priestly ministry Fr. Csaszar did many good things for the people that he served in his parish assignments. And so we ask that everyone pray for Father Csaszar, his family, friends, and parishioners during this most difficult time. According to the station, police were only in the preliminary stages of the investigation at the time of Csaszar's suicide. Csaszar worked at St. Rose Parish between 2005 and 2016. The Diocese of Columbus's website indicates he was ordained on June 26, 1999. The priest was a well-liked figure in his community, "You could always talk to him and felt comfortable speaking with him and he was always there to listen to you no matter where he was on the street or what it was," Cheryl Dodson, a New Lexington business owner, told the NBC 4. "He was one of my favorites. Out of all the Catholic priests I've known and affiliated with, he was one of my favorites." So SAD! I am off to evening Mass in a short while, prayers will be said and candles lit for this tormented Priest and his loving family. God does forgive, as this Priest would know, but he obviously could not forgive himself.......Rest in Peace Father Csaszar.